I remember back in 1996 when I started picking up CMJ New Music Monthly. I was so excited that someone was putting out a monthly magazine with a CD, so not only could you read reviews of bands you'd never heard of, you could also hear songs from the better ones of them. And it must have been 1999 or so when I first heard "Never Meant," by American Football, and I knew I was always going to be trying to get CMJ whenever I could. (They're still around as a website these days, I've just found out. I lost touch with them when the magazine became damn near impossible to find, and I didn't want to spring for the ridiculous amount a subscription cost.) "Never Meant" was a playful, dancing melody, elaborate guitar over a soft spoken singer talking about the process of falling out of love. It was complex, emotional and fragile. I remember listening to the song endlessly. 'Cause you can't miss what you forget"
Of course it was overly dramatic. That was the whole point of the song - that young relationships are always more intense than anyone can ever seem to describe, like no one else has ever known the pain you're feeling right then and there. I'd gone through a few breakups in college (on both sides of the equation, really) by that point, and the song spoke perfectly to the feelings I'd had then. I tracked down the album, and was delighted to find it was full of songs akin to "Never Meant." I was talking about it with one of the slightly older people at the Daily Nebraskan, the newspaper I worked at at the time, and he told me it was "math rock." I'd never heard the term before, so I did a little digging. It was a mostly Midwestern music movement focused around unusual time signatures, angular melodies and stop/start rhythms. I liked it, but I found quite a bit of the movement to be, well, tuneless. 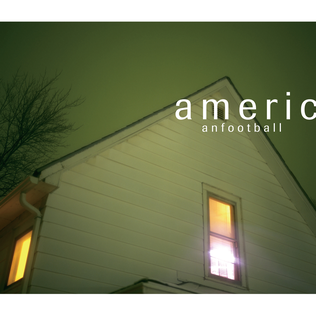 American Football broke up after this album, and Mike Kinsella, the voice of the band, went on to found Owen, a mostly solo project that has echoes of American Football in it, but is a little less ornate. That isn't to say Owen hasn't done some amazing stuff over the years, but I find myself missing American Football now and again.